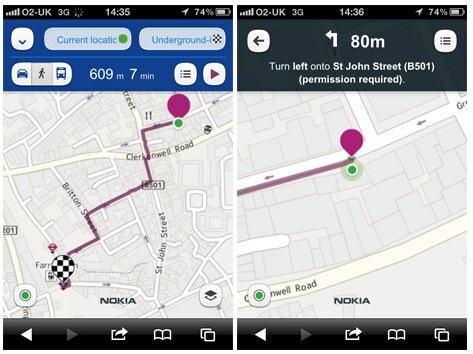 Nokia has just announced the launch of an iOS and Android-compatible version of its mapping service known as Nokia Maps. The service, which powers Nokia’s native mapping applications on its own devices, has not arrived as a native iOS and Android app, however, but as a HTML5-based web service available at m.maps.nokia.com. In addition to basic mapping, Nokia Maps provides navigation support, through separate sets of directions for those who are driving, walking or taking public transport. There are also audio directions available, but for now, these are only offered when you’re on foot. There are multiple map views available in the online service as well, including a default map view showing streets and labels, a satellite view, a public transportation view and even a live traffic view, which can help you better plan your route. However, there are drawbacks to using a web-based application over a native one. For starters, the app will need your permission to access your location in order to provide you with directions – and unlike native apps, it won’t remember your response to its prompt the next time you go to use the app. Also, when Nokia Maps provides audio directions, you have to wait while it downloads a 2 MB audio file to your device, as opposed to just having the audio play. And of course, mobile web apps are limited in terms of the background processing they can do, which could impact your ability to multitask during navigation. In early tests, it seems that the resolution of the online maps offering isn’t comparable to what you’ll get with a native application like Google Maps on iOS or Android, but the service itself was solid enough. It even has a nice, British-sounding man who prompts you to “start your journey,” which would make driving to a store feel like an adventure, I have to admit. Nokia Maps, you’ll remember, became core to Microsoft’s mapping service when the companies aligned their mobile strategies in early 2010. That’s why it’s interesting now to see the company attempt expansion to other non-Microsoft platforms. However, if Nokia really wants to compete with Google Maps (and perhaps Apple’s own forthcoming mapping service), it will need to release a native version that more seamlessly integrates with users’ phones and tablets. A web-based version of Nokia Maps would be a good first step toward that goal, though. 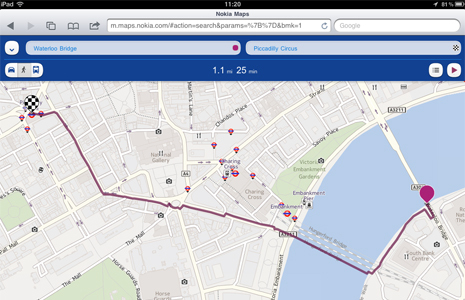 The new web app works on iPhone, iPad or Android (2.3+) device, and is accessible from m.maps.nokia.com.